Valuable Prizes Are Up For Grabs For Roserians! Marina del Rey, California - June 29, 2012 - Gravity Interactive, a publisher of exciting massive multiplayer online role-playing games (MMORPGs), today announced that it has launched a series of summer events for its popular MMORPG, ROSE Online. “Roserians” can participate in the events all month long starting today, June 29th, and take their shot at winning cool in-game items and Visa gift cards. Players can grab a friend at dive in at www.roseonlinegame.com. All month long players will have a chance to win Item Mall Points and Visa Gift Cards in the “Login and Get Loot” event. All players have to do is log onto ROSE Online and they’re entered to win. It’s that easy! For every daily ROSE Online login, players will get another chance to win. This event is happening all month long, so players should grab their friends and start logging in today through July 31st! Summer is all about hanging with friends and so is the latest refer-a-friend event, “Playing with Friends Just Keeps on Getting Better!” During the entire month of July, players can invite friends to play their favorite game with them and be rewarded! For recruiting one friend, players will receive a Judy’s Box (1 box limited per WarpPortal account). 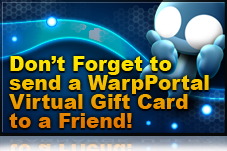 In addition, players using the “Friends with Benefits” program can send friends a link or just share on their favorite social network site and let friends hook them up with bonus WP Energy! If a player, using “Friends with Benefits” recruits a friend from now until July 31st, and they make a payment, players will earn 30% of the WP Energy value they purchased instead of the regular 10% bonus. Roserians can also participate in the GoCash promotion happening now through August 28th. Every Thursday following a GoCash game card redemption increment of $7 on the WarpPortal, players will receive a limited edition Drinking Hat (HP +250, MP +150), great for those hot summer days, in their game accounts event storage! Players can get all the latest information from the official ROSE Online Facebook at http://www.facebook.com/playrose as well as get a chance to post awesome summer fun screen shots. Marina del Rey, California -June 28, 2012 - Gravity Interactive, a publisher of exciting massive multiplayer online role-playing games (MMORPGs), announced today that the long-awaited Ragnarok Online Classic server will make its debut beginning tomorrow, June 29th. This latest server will cater to players that enjoyed Ragnarok Online in its more simple and classic form. To check out the Classic server and download Ragnarok Online for free, players can visit http://www.playragnarok.com/. Ragnarok has a long history, and through the years there have been several major updates to expand the world, game systems and ultimately even the game settings. The biggest update, Renewal, incorporated new stories and classes with a completely new experience. However, fans who miss the original now will have a choice of gameplay between the original “Classic” version and Renewal. This new Classic server will run as a completely separate server and use all the original game settings and physics! Players can expect a variety of standout features on the latest server including maps and quests, expanded classes; Gunslinger, Ninja, Taekwon Kid, Soul Linker and Taekwon Master, transcending, new drops and so much more! For more details about the latest server visit, http://blog.gravityus.com/?p=2934. Marina del Rey, California - June 21, 2012 - Gravity Interactive, a publisher of exciting massive multiplayer online role-playing games (MMORPGs), announced today that ROSE Online, the interplanetary fantasy online RPG, has launched in Portuguese. To play ROSE Online for free, players can go to http://www.roseonlinegame.com/ for more information about all of the available languages. ROSE Online is a free roaming interplanetary anime-inspired fantasy MMORPG where players fight monsters, gain character levels, obtain new skills and find equipment to prepare themselves for future battles. Players travel to different planets and explore new environments as well as battle other players and declare wars against other clans! The seven planets of the world of ROSE Online were created by the goddess Arua. However, Hebarn, the god of malice, took over the seventh planet and renamed it after himself. To protect the other planets from Hebarn, Arua created the Visitors and sent them to Junon, the first planet of ROSE Online. For daily dance parties, costume contests, and so much more check out the official ROSE Online Facebook at http://www.facebook.com/playrose. Marina del Rey, California - June 20, 2012 - Gravity Interactive, a publisher of exciting massive multiplayer online role-playing games (MMORPGs), is heading down to the coast for the annual summer festival in ROSE Online. Starting now and running until July 17th, players can grab their swim trunks and snorkels for some of the best summer events yet in ROSE! Players can hit the waves by surfing to to http://www.roseonlinegame.com/, and join all their friends at the beach for fun and sun. This year, Anzhelika in Luna is fed up with her snowy planes and demands to have some summer too. Collect the ingredients of summer and bring them to her bar in the Magic City of Eucar. The special ingredients are rare world drops available only on their planet of origin, so expect plenty of heated trading action. Once players have turned in enough of the ingredients, she will reward you with her special Luau Box containing a special Hawaiian themed item! If you don't get the prize you are hoping for, trade with friends, and be sure to collect all six items before the summer event ends. Roseans can also look forward to other exciting June announcements, including a full reveal of the Sea of Dawn next week, and a new language option coming soon. Players can scoop all the latest information from the official ROSE Online Facebook at http://www.facebook.com/playrose as well as get a chance to post awesome summer fun screen shots. "We’re changing the rules a little this year, to structure the competition the same way it’s held worldwide – and that includes adding some sweet cash prizes," said Jason Heimdallr Koerperich, Ragnarok Online Producer at Gravity Interactive. "This tournament is also the first time we’re permitting third class characters to join in, meaning the competition just went up a whole new level because these are powerful characters!" “Let’s get ready to ruuuuuuuumbleeeeeee.” The United States Ragnarok Championship (USRC) is about to begin. Teams of 7 will be able to brawl in last-man-standing PVP arenas. Regular tournament play will require a team to win 2 out of 3 matches to advance. Title matches, to determine 1st through 4th, will be a best of 5. Matches will last for a maximum of seven minutes: after that, whichever team has the most characters standing will be declared winners to break the stalemate. During the tournament, some skills will be restricted, including select abilities from the Shadow Chaser, Geneticist, and Sorcerer. Players will also be limited to 167 skill points total, so players will need to be creative in their character builds. Prior to battles, equipment can be purchased from vendors to ensure top quality gear is available to all to ensure a fair playing field. The big draw for this year’s USRC is the amazing Cash prizes! The tournament champions will win $1050 USD for our Champions, while the runner up team receives $595. Third place goes home with a respectable $350; for a total prize pool of $2000 USD! Spectators aren’t being left out of the tournament, either: sharing the Ragnarok Online’s Facebook posts, or tweeting with the hashtag #USCR2012 will enter fans into a raffle drawing for additional cash prizes. The delicate seals that protect the world from spilling into complete chaos weaken and break, and only the knowledge and power from the age of myth can save Midgard from certain doom. Can you and your allies push back the threat of total annihilation and protect Midgard from the final Ragnarok? Join now at Play Ragnarok Online, or follow the official Facebook at http://www.facebook.com/playragnarok. Sign Up Now For A Chance To Play For One Week Only! Marina del Rey, California - June 14, 2012 - Gravity Interactive, a publisher of exciting massive multiplayer online role-playing games (MMORPGs), announced today the official launch of the closed beta testing for Maestia: Rise of Keledus. Players can get their first taste of Maestia on the new official website at http://www.playmaestia.com/, and Register here to be one of the lucky few who will get to play for the next week. Maestia: Rise of Keledus is a fully fleshed fantasy MMORPG that is free to download and play. Follow a captivating storyline and launch head first into the eternal struggle for power and righteousness. Join fellow players in parties to challenge Instance Dungeons or band together in guilds for small and large scale faction battles. Adventure in an ever-growing world filled with quests, crafting, an advanced Mercenary system and more. "There is a lot of anticipation and excitement for Maestia and we are excited to finally open the doors and let players experience it for the first time,” said Jay Choi, Chief Operating Officer at Gravity Interactive. "We’ve chosen to do a short, personal closed beta so the most dedicated players can get a good grasp of the game, and we can use their feedback to improve Maestia before it takes its next steps towards launch." To celebrate the kick-off of the beta testing period, fans following the official Maestia Facebook page at https://www.facebook.com/PlayMaestia will have the chance to see exclusive screen shots, art, and participate in contests. Simply "Liking" the page will give players a chance to win one of five iPod Shuffles each week with more opportunities to win entries from now through the end of the closed beta. More news on Maestia, including the dates for Open Beta testing and additional game details, will be following throughout the month of June. Ride epic mounts determined by your class, take on massive world bosses designed to challenge a full party of players, craft the strongest weapons and armor or tame magical pets to fight at your side. All will be brought to life in a fantastical world filled with a lush art style showing both the dark and light side of a world thrown into a deep conflict that must be survived before it can be resolved. Maestia is a full-featured, fantasy MMORPG, following a story about the eternal quest for power and righteousness. Players are able to join Instance Dungeons, fight in battles that involve both guilds and factions, and participate in an advanced Mercenary system. There are also numerous quests that they can complete and items to create. Always free to play, and now with no download required, players can leap straight into a world of fascinating horror at http://www.playmaestia.com/.